On December 31, how will you know if you’ve succeeded? Step 1 – State your goals. Step 2 – Classify your goals. Step 3 – Explain the importance of your goals. Step 4 – Action items. Step 5 – Goal statement. From this Workbook, you’ll end up with a clearly-defined goal statement. A goal statement summarizes what your goal is, why you must achieve it, and the actions necessary to do so. All in one, simple statement. Concise. Specific. Memorable. Step 6 – Internalize your goals. With that in hand, you’ll be able to internalize your goal. To get your goal into your subconscious mind. So it’s always with you. Always available. On-demand. One way to do this is to read your goal statement when you get up in the morning. As you do this, day after day, your goal will be in your mind all day. Read it again when you go to bed. That way it will seep into your subconscious mind as you sleep. Soon, you’ll be able to pull your goal statement out of your memory, on demand. So when you’re sitting in line at the drive-thru or when you’re working out, think about your goal. Picture yourself taking the actions necessary to achieve it. Feel yourself actually achieving it. Great athletes do this; so should you. Be consistent and persistent. You don’t have to be a hero. Just day by day, hour by hour, minute by minute, work to achieve your goal. Before long, you’ll be ready for another goal … because you’ve already accomplished this one! The Bigg Goal-Setting Workbook For Bigg Goal-Getters Like You is full of great tips, inspiring quotes, and printable forms that you can use to set, and get, your goals. And it’s free! 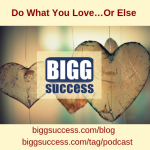 All you need to do is sign up for our free newsletter, The Bigg Success Weekly. And when we say “weekly”, we mean it! We promise not to fill up your Inbox with a bunch of e-mails. Each week, you’ll get some great articles, success stories, timeless principles, leading-edge applications, and links to help you succeed bigg! So sign up for a free newsletter and get a free tool. A tool that you can use today! How’s that for a deal? Our bigg quote today comes from Ellen Goodman. So look for your potential … define the success you want with your bigg goals this year. Because you’re a bigg goal-getter, too! Next time, we’ll discuss the single most destructive thought you can have. Until then, here’s to your bigg success! https://biggsuccess.com/wp-content/uploads/2015/07/BIGG-Success-Nurturing-Your-Inner-Entreprener.jpg 0 0 George Krueger & Mary-Lynn Foster https://biggsuccess.com/wp-content/uploads/2015/07/BIGG-Success-Nurturing-Your-Inner-Entreprener.jpg George Krueger & Mary-Lynn Foster2008-01-01 00:13:292007-12-31 19:54:28How Do You Define Success?